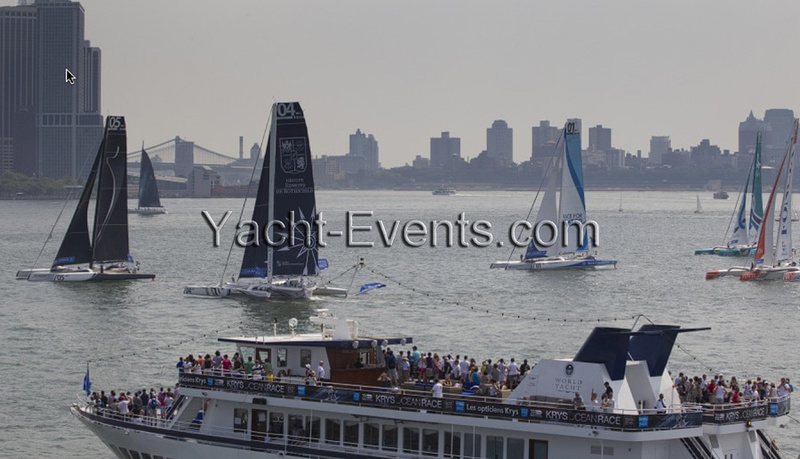 Yacht Events LLC is proud to be chosen to host the start of KRYS OCEAN RACE-in NYC and welcome The Krys organization aboard. Saturday July 7th, 2012. The set up started this afternoon. Tune over the weekend to see the fun begin. With the spectacular Manhattan skyline as the backdrop the courses should be orientated as a beam reach, at 90 degrees to the wind – or close to it – to ensure that this is just a simple test of speed and turning corners. The forecasted breeze for today is around 10kts from the NW with around 2.5kts of current flowing across the course. The Speed Match is not for Multi One Championship points but is purely an exhibition event. The first section is a Round Robin league where each team races each other twice with the top four teams going into a knockout Semi-Final then the Final.